Remember you can post back one closed (history) year and the system will automatically fix beginning balances for balance sheet accounts and Retained Earnings for income statement accounts. This provides the ability to post adjusting (audit) entries after your close. Ensure all year-end entries are entered and posted and you’ve printed any required reports such as a trial balance or financial statements. Reconcile retained earnings before you close. You can post back one closed year so if you have any issues with retained earnings you’ll be able to identify them BEFORE you close. Ensure the posting accounts are set with the correct posting type. Using the account smartlist, export the general ledger accounts to excel and sort by the posting type, then by main account and all incorrect accounts will be listed between the balance sheet and the income statement. The following shows two accounts improperly identified as a Balance Sheet posting type which will cause your retained earnings to be incorrect after the year-end close. If you are running the Multi-Currency Module, be sure to very that your retained earnings account has access to all currencies (go to cards>>financial>>account, choose retained earnings then choose “Currencies”). Note: this is only if you record transactions in one company other than your functional currency. Backup your data – most company’s data is backed up at night so the best method is to do your year-end close first thing in the morning. If it fails, you can restore from the night before. However, sometimes backups can fail so verify the backup is successful before starting the year-end process. 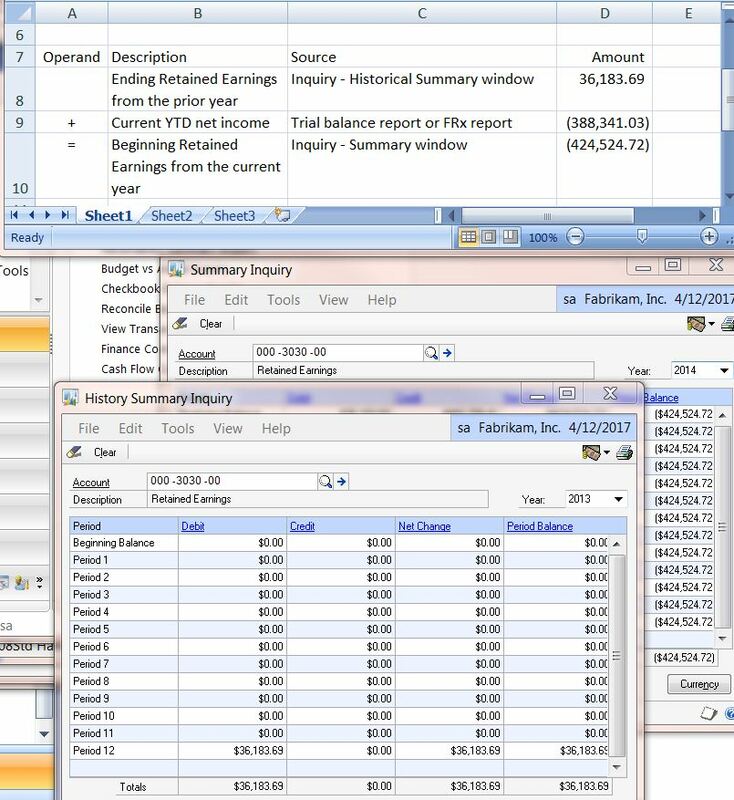 Start the year-end close by going to Microsoft Dynamics GP>>tools>>routines>>financial>> Year-end closing window. When you click on “Close Year” the system will respond with the following window if you have any unposted transactions, regardless of date. The next window will ask if you want to print, I always chose a file for future printing if necessary. Reconcile retained earnings after the close, below shows how to take the prior year retained earnings plus net income to get your beginning retained earnings for the current (new) year. The other optional step is to perform file maintenance but most clients wait until an upgrade.